Technologies, opportunities and trends related to the internet and other digital channels such as mobile are moving very fast. Especially if your core business lies not exactly in these areas, it is very difficult to always be at the pulse of time. ivisory of course takes care of these for you. Your points of contact all have a relevant education with many years of practical online experience on senior level, are guests and speakers on international conferences. Serious trends or fantasies of management consultants? A constant refresh of these topics requires time and effort. 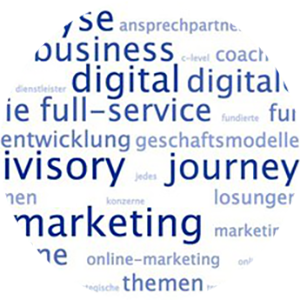 ivisory digital consulting group operates in these fields every day. Moreover, it is often difficult to distinguish whether there are new issues and trends, or if it is simply an existing concept which is suddenly “en vogue”. Is a customer journey analysis something new? Is “Big Data” – the basis of many industry conferences at the moment- an entirely new phenomenon? Multi-channel marketing? This has not only been invented within the last years but reflects the basic psychological needs of modern mankind. We offer you personal 1 on 1 coaching so are a proficient leader and manager to your employees and also can give qualified orders to your service companies serving you. As a manager and executive, you will receive an individual training on eye-level. Whether once-off or at regular basis. With a roadmap for a certain period or booked spontaneously when needed. Whatever topics are relevant to you, we are your resource that covers your back. A ghost “listener” instead of a ghostwriter, the prompter in your digital theater or simply your management coach for digital topics. Please do not hesitate to contact us and tell us your topics of interest. Or we deep dive into your industry and identify the relevant topics that are presently of interest or future trends. From basic wrap-up training in online marketing in 2-4 hours to a day long for detail topics of your industry, we will fully follow your needs and your wants. Of course fully individual and confidential, like all the services of ivisory.